EOD Levelers are the most economical way to service trucks with minimal height differences. 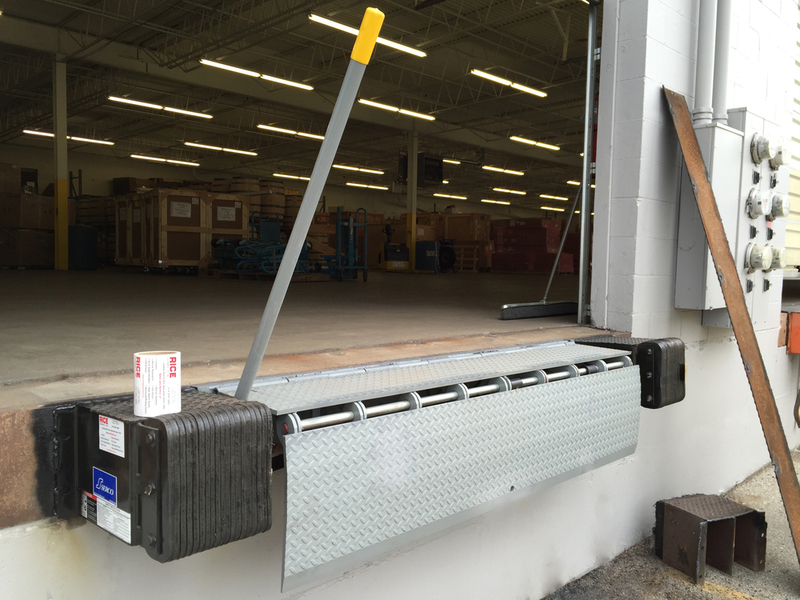 Operation is safe, simple, and ergonomic for all of your loading dock attendants. Say goodbye to backbreaking portable plates. Our Edge-of-Dock Levelers offer the convenience and capacity you require. Serco Edge-of-Dock levelers are an effective, affordable alternative to portable plates. This loading dock leveler mounts to the face of the dock to make loading and unloading trailers easier, and is ideal for medium traffic loading docks. With a simple, push-button style, you’ll get the reliable durability you’re seeking, with improved performance that doesn’t break your budget. Capacity ratings up to 30,000lbs. Can be used with fork-lift traffic. Standard widths include 66", 72" & 78". Rice Equipment offers numerous ways to securely anchor your Edge-of-Dock Leveler. Adding a steel cap to your door opening can eliminate your need for concrete work, and add years of dependable service. Other Edge-of-Dock levelers utilize a manual lifting hook, which requires a huge amount of lifting force. These hooks are difficult to manage, and introduce dangerous pinch hazards. Similarly, other EODs require that your center of gravity is out over the front of the leveler, requiring a high degree of balance, skill and timing. Serco's EZ-Lift system eliminates the frustration, simply insert the bar & pull back. Once the leveler-lip lands safely into the trailer, you're good to go. Operation of your Edge-of-Dock leveler is simple, requiring as little as 15lbs of force to operate. The patented EZ-Lift design is counterbalanced by the Spring Assist system. A heavy duty, steel lifting handle with safety grip offers simple and intuitive activation. Operating range is 5" above and 5" below dock height. The Serco SA Series air-powered edge-of-dock leveler pairs an air-powered lifting system with convenient push-button operation, taking the manual labor out of loading and unloading trailers for maximum efficiency. Using a patented air bag lift system, this dock leveler offers a reliable performance that cuts down on the cost of ownership, since there are no springs or hold-down to repair or replace. Other premium features include a lug-style lip hinge for even greater strength and durability, along with tire laminated bumpers and an integral maintenance strut. Having trouble with the service-range of your current EOD? Our raised EOD levelers are perfect for dock positions that are typically too low.